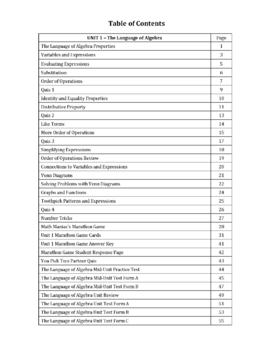 The Language of Algebra-Unit 1 is just one in my Practice-To-Perfect series of reproducible, skill-oriented activity books. 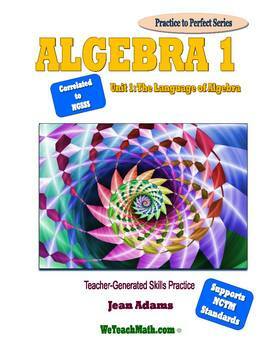 The Algebra 1 series is designed as a resource for pre-algebra and algebra teachers who are looking for an effective way to offer additional practice to their students. Each activity is correlated to the NCTM Standards. NOW WITH AN ANSWER KEY! 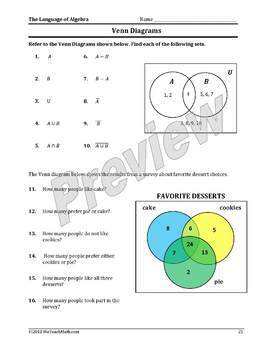 The unit includes 57 pages of extra practice handouts beginning with property definitions and vocabulary, order of operations, distributive property, Venn diagrams,variables and expressions and much more. There are four quizzes, two mid-unit tests, three end unit assessments, Mid-unit and end-unit reviews, and a "You Pick Two" partner quiz.All documents have answer keys. As enrichment, there is a Number Trick activity, a Toothpick Patterns and Expressions activity, and the Math Maniac's Marathon Game with 30 cards of applications with a game board.